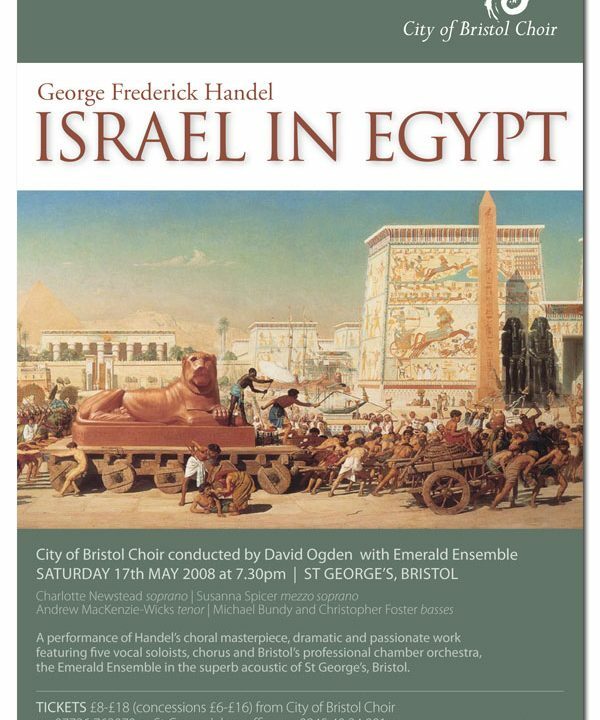 Handel’s Israel in Egypt is a dramatic and passionate work featuring five vocal soloists, chorus and full orchestra. In this great oratorio, the chorus takes the starring role in telling the Biblical story of the Hebrews’ escape from oppression and slavery in Egypt. The work features virtuosic double choruses showcasing some of Handel’s most colourful music telling tales of plagues of hailstones and lightning, buzzing flies and leaping frogs. All are brilliantly realised for soloists, choir and full orchestra in a series of incisive arias and choruses following Moses and the Children of Israel through the events of the Exodus. The epic nature of the story is the perfect subject to showcase Handel’s genius for story-telling and drama. An 80-strong chorus from City of Bristol Choir is joined by an impressive line up of soloists, together with Bristol’s professional chamber orchestra the Emerald Ensemble, all under the expert direction of David Ogden. An unmissable evening’s entertainment in the superb acoustic of St George’s concert hall in Clifton, Bristol. Charlotte is well known to audiences in Bristol and the South West as a concert soloist and recitalist. Recent performances have also taken her to Snape Maltings and to London to St Martin in the Fields, The Temple Church and Greenwich Theatre as well as recital work in France and she has also given a live recital on Classic FM. One of the first female choral scholars at Trinity, Cambridge, Susanna is a highly experienced concert singer. Her solo engagements have included appearances at many of the UK’s top concert venues including the Royal Festival Hall, the Barbican, Snape Maltings, the Royal Albert Hall and at the BBC Proms. She has worked with many of the most promient conductors including David Willcocks, Trevor Pinnock, John Eliot Gardiner and Simon Rattle, as well as operatic roles with Glyndebourne Festival Opera, Kent Opera and Opera de Lyon. Andrew’s extensive concert career includes performances throughout Britain and Europe and at the BBC Proms. He has toured with The Monteverdi Choir and Sir John Eliot Gardiner, The Gabrieli Consort and Paul McCreesh, and with The King’s Consort. His operatic repertoire encompasses major roles in operas by Handel, Mozart, Rossini, Donizetti, Puccini and Richard Strauss and also more contemporary works by Stravinsky, Prokofiev and Britten. Michael’s oratorio performances have included all the major works of the repertoire in the UK’s principal cathedrals and concert halls and abroad, including Elgar’s Dream of Gerontiusin Prague. His solo engagements with Sir John Eliot Gardiner have included a performance of Israel in Egypt at the BBC Proms. He has toured Europe, Turkey and Japan with Trevor Pinnock and The English Concert in Bach’s St Matthew Passion and has sung with groups such as The Sixteen, Orchestra of the Age of Enlightenment, Futurum Ensemble of Sweden and BBC Singers. Christopher has performed throughout the UK and Europe with orchestras such as the BBC Symphony, Britten Sinfonia, Les Musiciens du Louvre and La Chapelle Royale, and with conductors such as Pierre Boulez, Andrew Davis, Mark Minkowski and Philippe Herreweghe. Particularly notable performances have included Handel’s Messiah and Bach’s B minor Massfor Spanish Television in Madrid, the Latvian premiere of Elgar’s Dream of Gerontius, and what is believed to be the first performance of Messiah to be given in English in China, in the Concert Hall of the Forbidden City, Beijing. 2005 saw his Royal Festival Hall debut with the Royal Philharmonic Orchestra in Mozart’s Requiem and Wigmore Hall debut in a concert of Bach Cantatas. Emerald Ensemble is Bristol’s professional chamber orchestra, and is renowned for its accessible, passionate, warm and virtuosic performances. The group holds a pivotal position in South West music, presenting eighty events per year in the region’s major venues. Formed in 1994 by Roger Huckle, Emerald is a musicians’ collective, bringing together the best of the region’s performers. The group regularly works with outstanding international artists and soloists, including Julian Lloyd-Weber (cello), Emma Kirkby (soprano), James Bowman (countertenor), Emma Johnson (clarinet), Pee Wee Ellis (saxophone), Victor-Hugo Villena (Argentine bandoneon), and Principal players of the Orchestra of the Age of Enlightenment.